It’s Friday, 9 PM, and the night is just getting started. You’re ready to enjoy some dancing with your friends. You walk into the nightclub of your choice (with your wristband and hand stamped of course) and you see colored lights flashing to the beat. Dancers are heating up the dance floor. You feel the bass in your chest. The music invites you to move. Have you ever wondered why a loud club or rock concert is so much fun? Found in the inner ear is the sacculus (pronounced as sack-you-less) that has direct connections to pleasure centers in the brain. It releases endorphins when stimulated by loud music, so listening to loud music is essentially self-medicating. The sacculus particularly likes low frequencies (bass, basically) above 90 decibels, according to the research of Dr. Neil Todd. Funnily enough, at one point in time it was believed that the sacculus had no real purpose. Little did they know that it’s responsible for the joy we find in music! There’s so much music and so many songs out there. A lot of these reach a level of complexity that just cannot be appreciated at low volumes. Simply put, when playing loud music, the details become easier to pick up. Usually, being able to hear more details and picking up different sounds means the music sounds better. After all, that is how the artist created it – all little details included. This is part of the reason many audio engineers and people mastering songs have tinnitus. After years of wearing high-end headphones and blasting songs at an increased volume to make sure the mix is just right, they have permanent hearing damage. Getting chills when listening to music is called frisson (pronounced like free-son) and it happens when dopamine floods the body. 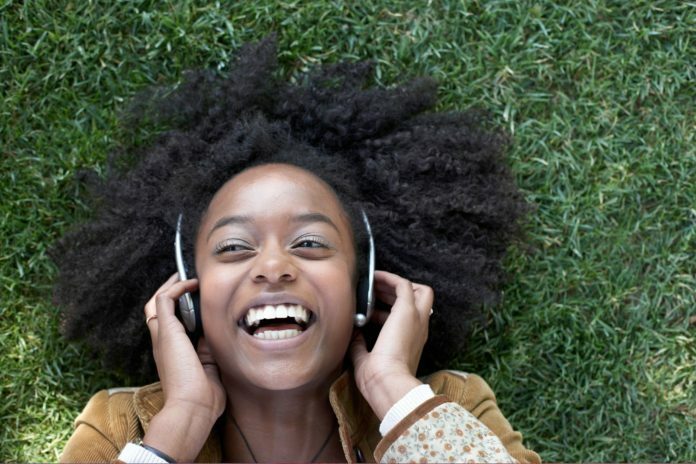 People who react to music have strong connections between the part of the brain that interprets sound and the part that creates emotion. Valorie Salimpoor, a neuroscientist at McGill University, has conducted research where the subject was hooked up to a fMRI machine while listening to music. It was shown that our brains release dopamine on peak moments in the song. And that’s not all. She also discovered that, when listening to songs we already know, the anticipation of peak moments triggered dopamine release as well. Combine these two factors, and you know why you feel so emotional (be it euphoria or sadness) when listening to music you love. You know those moments when you’re driving, and as soon as you are close to your destination or looking for a parking spot, you turn the music down? Exactly. It’s like you cannot focus on other things when listening to loud music. This is (partially) true! Loud music takes over the brain: it overwhelms the other senses in a way that is similar to alcohol or drugs. It becomes all-consuming. Sometimes, blocking out the world and just enjoying the emotions of the music is a much-needed experience. You can compare it to other stimulates like caffeine, cocaine, alcohol, and exercise. It increases the heart rate and body temperature. Loud music has even been proven to speed up a runner on a treadmill! Walk into a gym and take a look around. There’s probably a lot of people working out while listening to music – because it actually helps! Are there downsides to loud music? So the next DJ takes over. Except for the new DJ is playing the music even louder. So loud it hurts. You want to stay (maybe you should have brought earplugs) but you can’t be in the club when the music is that loud. Just like almost everything, too much of a good thing can be dangerous. Unlike some other dangerous substances though, it takes years of “abuse” to notice the damage. Compared to the pleasures of loud music, the danger of hearing loss may feel like a distant risk. There is also the misconception that loud music will cause no damage unless it’s painful, which tends to be in the range of 120-140 decibels. But hearing loss can happen when the decibels are as low as 85, especially when the exposure to this amplitude is constant. Clubs tend to blast music louder than 115 decibels (a normal lawnmower is 100 decibels). People will experience significant damage listening to this level for eight hours. This may cause a ringing in your ears, even when you’re not standing next to the speaker. And not just for a day, if you’re not careful the ringing could be for life. It’s important to protect your ears so you can keep enjoying music for life.